I was born in a small wooden house surrounded by rubber trees about 36 years ago. My first recollection of life was that of a water well because my house did not have a running water supply until much later. Like many kampung Malay kids, I grew up not having much of anything. My worldview was shaped by my surrounding. Since some of my elderly cousins became teachers, I wanted to go one step ahead of them – so I started my young life wanting to be a university lecturer (which was the coolest job I could think of when I was eight years old). Although life was difficult and we were always conscious that we wouldn’t have enough to go around, I grew up with full of pride. My parents raised us not to be apologetic about anything. From a very young age, I learnt that a man’s mortal enemy is his own self pity. Thus, I grew up in a family environment that was full of energy and positivity. Living a dignified honest life on my own terms becomes an objective that I pursued doggedly from a young age. We are, after all, the master of our own fate and fortune. It is this belief that forms the bedrock of my conviction that for Malaysia to progress, we must heal from the self-inflicted wound of mistrust, mediocrity and mismanagement. After four decades of divisive policies that favour only the well connected elites of the society, the cancerous downside effects on the society’s morale and self-confidence are all too apparent. The very prerequisite that can make this country great again – pride in ourselves – diminishes by the day. The Umno elites predictably resort to scaremongering and running down the very group they claim to protect i.e. the Malays. Every day, the Malays are being fed with a concoction of lies that they cannot survive on their own without the government’s protection. The good Malays were systematically replaced by the mediocre Malays in every sphere when the Umno-led BN government ditched meritocracy in exchange for mediocracy – it was no longer skills, qualifications or business acumen that get you a big break, it was which Umno or BN ministers you know. The unintended consequences of such selfishness and shortsightedness were devastating to nation-building efforts. A culture of mediocrity and mistrust perpetuated by the Umno-led BN government finally allows for mismanagement of the nation’s wealth to go unchecked. I have always advocated that a change to a needs-based policy (from race-based) is not only morally right to ensure fairness to all, more importantly it is a necessity to instil pride and goodwill in every single Malaysian so that we can move on confidently. 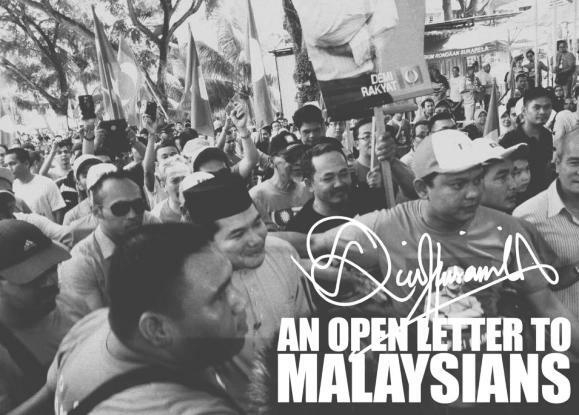 It is not fair to burden the young Malaysians with the baggage of the past. They have every right to grow up believing that they can achieve their fullest potentials under the Malaysian sun if they are morally upright, honest, industrious and smart. They deserve a society that can feel good about itself, without the bitterness of mistrust and racial connotations. They need to have the confidence that the government will take care of the most vulnerable groups in the society regardless of background and affiliations. Our young Malaysians deserve to grow up in a positive environment that thrives on the utmost confidence we have in ourselves and our capabilities, only then can we break free from the ghost of the past which inhibited Malaysia’s potential all this while. We have a lot of work to do if we hope to accomplish this. We need to fix the schools because fixing the schools means we fix the society. We have to ensure that the good ones in the society are given the best opportunity to soar to the sky while we build a net to catch those less fortunate so that no one is left behind. Malaysians have to look at each other differently. Instead of looking at our differences, we are better off cherishing the common fondness that binds us together – our colourful food does more justice as a testimony to our ability to appreciate each other than we ever dare to give credit to ourselves. Malaysia is a young nation. It has gone through a lot and the experience accelerated its maturity. It may have erred in the past, but its future is the brightest on this side of the horizon. Let us look forward to that future and leave the past behind without any blame. Looking back, I am ever grateful that I was able to cast my inferiority earlier on in my life. I could because I had a good support system and a good education. The future of our society lies in our classroom and with our young people. I am glad that while I may have pursued a different professional career, the yearning for teaching and knowledge never dies. Deep inside I have always been a student and a teacher that allowed me to go through a journey of humility to see life from different perspectives. We must ensure that education reforms become an obsession of our next government because every child deserves a chance to cast away his/her inferiority and inhibition earlier on in life, so that they can do wonders later on. As we go to the polling station this Sunday, I hope my fellow Malaysians hold our heads high and look to a brighter future. The days when we are put down by our own government shall be over. We shall be the master of our nation’s destiny and fortune. I may be relatively young, foolish and naïve to hope for better things for Malaysia. I don’t pretend to know what my fellow Malaysians want, but I offer my youth, energy and undying love to make it a better home for everyone. Because we owe it to our young people and ourselves to put Malaysia where she deserves. Rafizi is the candidate for the Pandan parliamentary seat in the coming general elections. I say "Watch this young man." If he continues with his fair and upright priciples over the next few years, I would gladly have him as one of the federal leaders, even as PM! Be grateful for all the benefits we gave rec'd but do not fear the ghost of the past. Look forward and vote for a brighter future. Which side have leaders that have potential, vision and capabilities to lead our nation? Overcome your "513 fears" and help create a better future for our children and theirs! So glad that Rafizi won the Pandan parliamentary seat by a majority of 26,729 votes. Other young and rising politicians to look out for are Ong Kian Meng, Zairil Khir Johari, Wong Chen, Hannah Yeoh, Nik Nazmi Nik Ahmad. Hope they maintain their integrity and champion the rakyat's causes in Parliament.